Coordinates: 14°38′52″N 74°19′47″E﻿ / ﻿14.64781°N 74.32970°E﻿ / 14.64781; 74.32970 Karwar Airport is a proposed airport and will be built by the Indian Navy at Alageri village near Ankola, in Karnataka. The Airports Authority of India (AAI) will operate a civil enclave at the naval air base which is part of the Navy’s Rs 10,000 crore Phase 2 of Project Seabird. In early 2007, there were reports of a concerted move by the Navy, the AAI, and the state of Karnataka to extend the runway planned at the naval base at Karwar to 2,500 metres (8,200 ft) to accommodate Airbus A320s and to acquire 75 extra hectares for this purpose. However, there have been no corresponding plans announced so far to relocate flight training from Dabolim to this airport or any other more convenient place. The Navy requires more land to expand the airport for civilian use and is waiting for the Karnataka Government to acquire more land for the construction of a runway. The AAI, which carried out an inspection of the site at the request of the Karnataka Government, had given suggestions regarding orientation, location and extension of the proposed runway to 2,500 metres and also of its land requirements of an additional 75 hectares. The State Government has requested the Central Government to bear the cost of acquisition of this additional land, estimated to be Rs. 20 crores. ^ a b "Project Seabird all set to enter Phase-2". Times of India. 5 December 2009. Retrieved 1 May 2012. 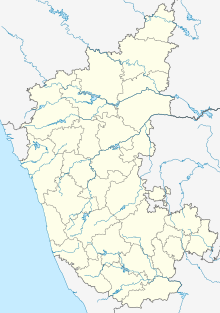 ^ "Indian Navy planning new air base in Karwar". Daily News & Analysis. 21 March 2012. Retrieved 1 May 2012. ^ "Expression of Interest, Project Seabird Phase 2A" (PDF). Indian Navy Information Centre. Retrieved 1 May 2012. ^ "Project Seabird on course". Bharat Rakshak. 26 October 2008. Retrieved 1 May 2012. ^ "Strategic Significance of the Naval Base INS Kadamba". South Asia Analysis Group. Retrieved 1 May 2012. ^ a b "Government Exploring possibilities opening of Karwar Airport for Civilian Air Services". Press Information Bureau, Government of India. 19 December 2006. Retrieved 1 May 2012. ^ "Karwar Airport". Infrastructure Development Department, Government of Karnataka. Retrieved 1 May 2012. This page was last edited on 20 January 2019, at 13:20 (UTC).